December is here and the countdown to Christmas has finally begun. We’re getting all festive at the Nicki Macfarlane Boutique and the latest shop window is putting us in the Christmas mood. 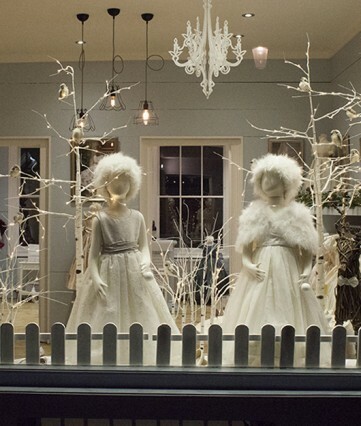 With pretty white dresses, including the beautiful silver print Rose and sparkly Tinkerbell flower girl dresses, our Wonderful Winter Wonderland window is enhanced by the beautiful twinkling tree lights and pretty woodland birds (not to mention our favourite Jelly Cat Owl!). The stunning Christmas wreath in the door finishes the window off to perfection! Visit our Langton Street store and see the Christmas window for yourself – we would love to see you there! This entry was posted in Nicki Macfarlane Shop. Bookmark the permalink.